I want to preface this by saying that the Fathead Pizza Crust is not my original recipe, though I wish that it was. This recipe was kindly provided by Tom’s older brother’s oldest son over at fathead-movie.com. If you haven’t heard about the Fat Head Movie, you must be living under a rock (and that’s okay!). I invite you to check out the movie and all of the wonderful information on the Fat Head website. Over the years, I’d like to think I’ve developed a certain knack for all things pizza. I mean, have you tried my Zesty Pizza Dip? I really could eat it every single day of my life. And some weeks I have. I ain’t afraid to admit it. But something glorious happened one day when I was nearly at my wits end with an extreme pizza craving. I stumbled upon the Fathead Pizza Crust and my life forever changed. 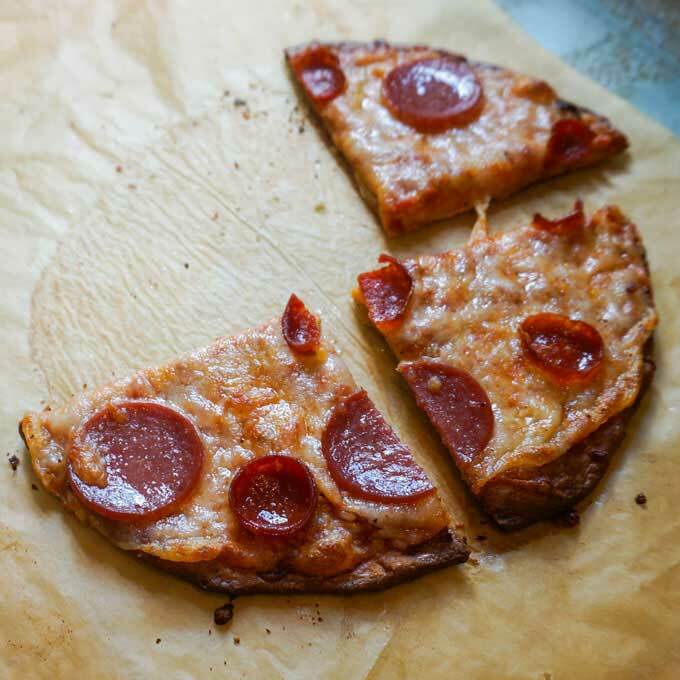 While it may seem a little daunting, the crust is comprised of just a handful of ingredients to mimic a real pizza crust. In fact, you probably have a lot of these in your pantry and refrigerator already! As I tend to do with almost every recipe, I added some ingredients to appeal more to my personal tastes. Notably, the addition of oregano and nutritional yeast has been an awesome combination. The oregano adds a really nice burst of authentic Italian taste and the nutritional yeast adds an additional layer of cheesy flavor. In the past, I’ve added oat fiber which will make the dough more biscuit-like. I really like the flavor of the oat fiber, but I am all about a nice crispy crust! Line a cookie sheet or pizza pan with parchment paper. In a mixing bowl, combine almond flour, nutritional yeast, oregano and garlic powder. In a separate microwave-safe bowl, add cream cheese and shredded mozzarella. Microwave on medium-high for 30 seconds. Stir. Heat another 30 seconds. Repeat process until cheese is completely incorporated and has formed a melty texture. Quickly incorporate with dry ingredients, beaten egg and combine. I initially start with a wooden spoon and eventually use my hands. If the ingredients stick too much to your hands, wet your hands slightly with warm water. It should help prevent sticking. When thoroughly combined, dump onto parchment lined pan and spread evenly out into desired thickness. I tend to like mine on the thinner side. Again, if the dough is sticking, wet your hands and continue to press out. When you reach the desired thickness and shape, jab holes in the top of the dough with a fork. This will prevent some air bubbles. Put crust into oven for 12-14 minutes, or until the top is a nice golden brown. Half-way through, open the oven and check for more air bubbles. If you see them forming, jab them with the fork and return to the oven. Remove from oven and add toppings. This crust is fairly stable and can handle a good amount of toppings. Return back to the oven until cheese is melted. I personally like to finish with a quick broil in the oven for a nice crispy top, but that is completely optional. Remove and let cool slightly before serving (it will be hot!). Enjoy! This is easily one of the best low carb pizza crusts! Finally, let’s not forget about the toppings. Personally, I love a traditional pepperoni pizza. Mushrooms, too. I’ve done a ton of variations including Buffalo Chicken, Taco, Philly Cheese Steak and more — all with the Fathead pizza crust! What are your favorite pizza toppings? Comment below! Can I sub out the Almond flour with Coconut flour? Not directly, the measurements will be different. Typically you need less coconut flour and a lot more eggs or moisture. Experiment with it!